What is the difference between the ground cover called Purple Heart and the purple colored plant called wandering jew? Purple heart, Setcreasea pallid, is a perennial native to North America, can be grown in full sun to partial shade, and in a wide variety of soils. In north Florida, frost may kill back the tops, but it quickly returns in the spring. Set plants on 12-inch centers. Plants will require initial watering until established and then will need watering only during periods of extended drought. Propagation is by stem cuttings, which root easily. This sprawling, evergreen ground cover produces deep purple foliage and stems when grown in full sun. It also cascades nicely over retaining walls and does well in a hanging basket. Purple heart produces small, pale pink flowers from the tips of stems and last only one morning. No pests or diseases of major concern although mites and chewing insects may occasionally c ause injury. 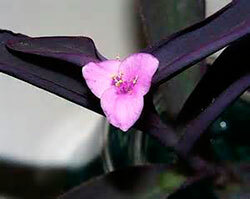 Wandering jew, Zebrina pendula, is a totally different species, although it looks somewhat similar to Purple heart. It would be difficult to find a more colorful or faster-growing groundcover than wandering Jew. The purple-green leaves with broad, silvery stripes and purple undersides are produced along the succulent stems, which root wherever they touch soil. Small, insignificant, rose-pink flowers are produced among the leaves of wandering Jew all through the year. It is not native to North America, and will grow in a variety of soils but should be planted in partial to deep shade and receive regular watering. It is often used as an indoor plant or grown in hanging baskets. The cultivar ‘Purpusii’ has dark red or red-green, unstriped, hairy leaves. ‘Quadricolor’ has metallic-green leaves striped with green, red, and white. There is also a green and white cultivar available. Propagation is by stem cuttings, which root easily. As a review, Purple heart is native to North America and can be grown in full sun. Wandering jew requires shade and is originally from Mexico. Categories: Groundcover | Tags: Groundcover | Permalink.